The giant hairy scorpion is native to Arizona, Nevada, Utah and California. There are eight known species which live in rocky deserts where they dig deep burrows in dry sandy areas. These scorpions are the largest found in North America. They range in size from 5.5 to 6 inches. They tend to have a yellow–green appearance. This species of scorpion is rather docile and would be a good choice for a beginning collector. They will rapidly run away from confrontation, but will assume a defensive position and sting if they are either cornered or provoked. 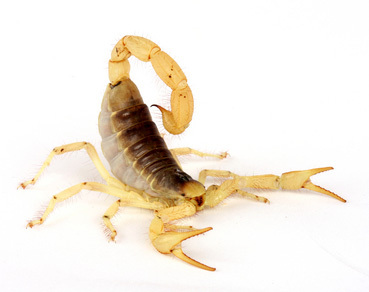 The venom of giant hairy scorpions is considered weak to mild, but if you are stung pain and swelling will occur. A ten gallon terrarium or aquarium with an under tank heat pad makes a suitable habitat for the giant hairy scorpion. The substrate should be three to four inches of a mixture of sand and potting soil or Eco-earth. A shallow water dish and hide areas such as cork bark should be provided. Food for the scorpion consists of gut loaded crickets and other insects.